Lemonade Mint Julep - An Easy Kentucky Derby Cocktail! 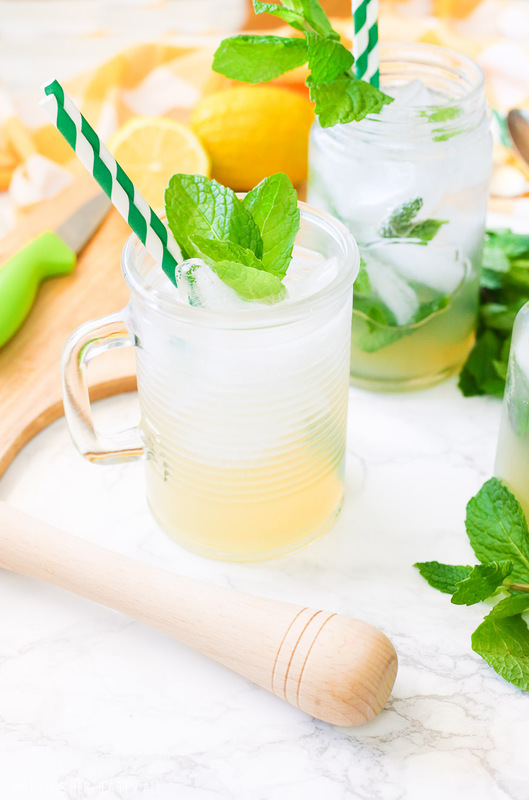 This lemonade mint julep recipe blends summer’s most refreshing fresh squeezed lemonade and stirs it up into spring’s hottest mint julep cocktail! 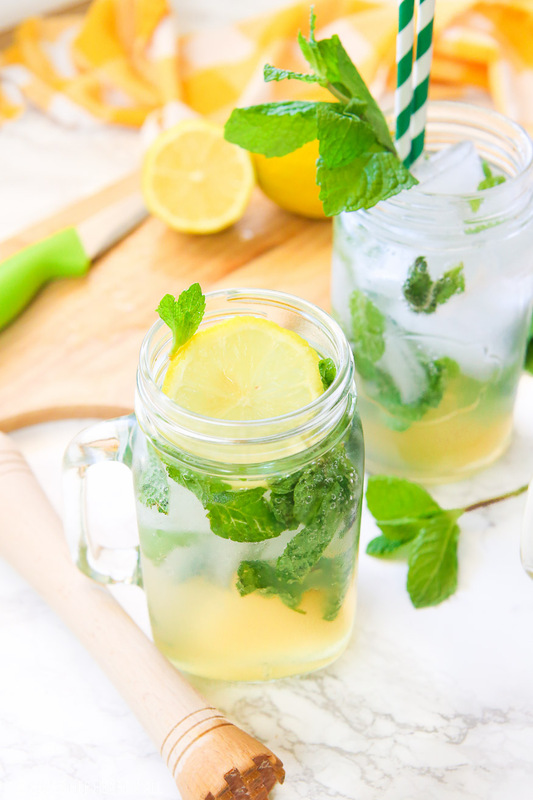 Lemon, bourbon, mint, and sweet that’s perfect for an outdoor party, watching the Kentucky Derby, or just a relaxing time outside on your back porch! I was definitely one of those little girls who was obsessed with horses and ponies growing up. Unfortunately for my husband, I never got over that. When I was in vet school I spent my summers working on the nearby horse race track. I spent many summers in Kentucky showing my horses and visiting race tracks. Every spring Atlanta has its annual Atlanta Steeplechase and Alex and I are sure to host a party while cheering from the crowd. So to say that spring time surrounding the Kentucky Derby is a big deal for us would be an understatement. To also say that I am a mint julep connoisseur would be fairly extremely accurate. Attending all of these horse related races and events comes with drinking a fair share of mint juleps. 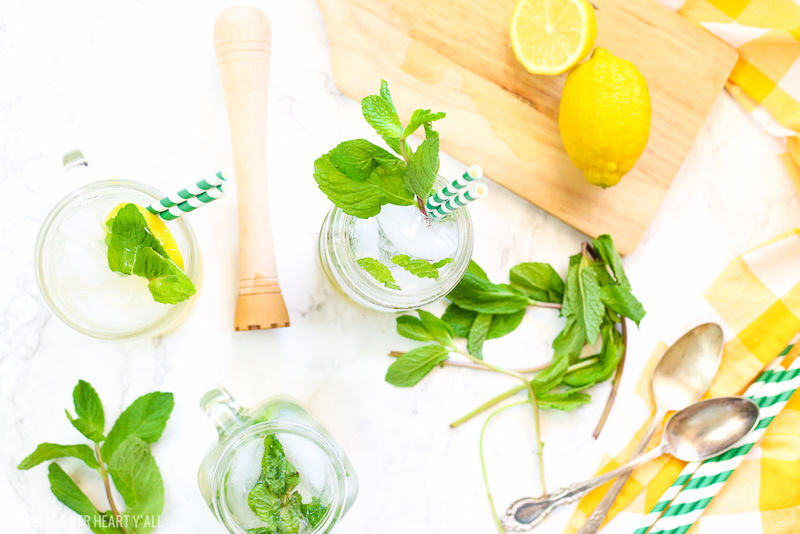 When I decided to go out on a limb and combine two of my favorite sipping drinks for warm and sunny spring afternoon’s watching horses go by, I decided it was time to introduce lemonade to the julep. So that’s when I tried my hand at squeezing some juicy fresh lemons into some hand-squeezed lemonade just like Cotter Crunch did in their Turmeric Ginger Lemonade. Then combined the lemonade with the crispest mint julep ingredients, mint, bourbon, and a quick simple syrup. The end product is nothing but deliciously refreshing, sweet with a pinch of lemony tart, a bit boozy, and minty and fresh. 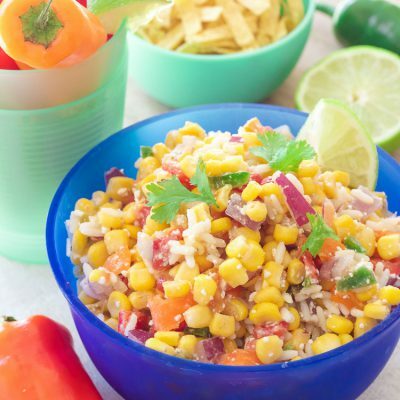 Now does that sound nothing but completely delicious? 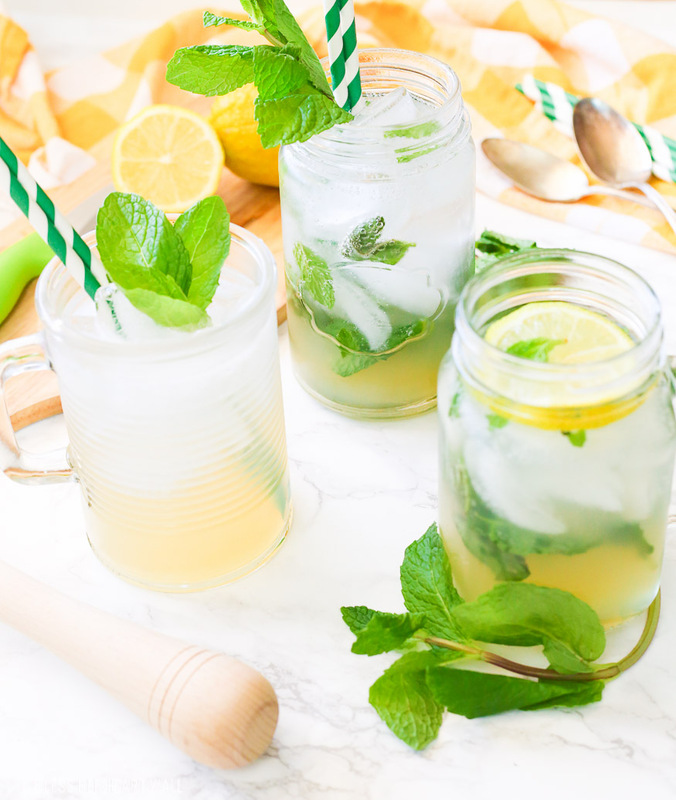 ONE: If you like the muddled mint in your glass I would recommend muddling the mint and simple syrup in each glass individually and then adding in the lemon juice, ice, bourbon, and sparkling water to each glass separately. 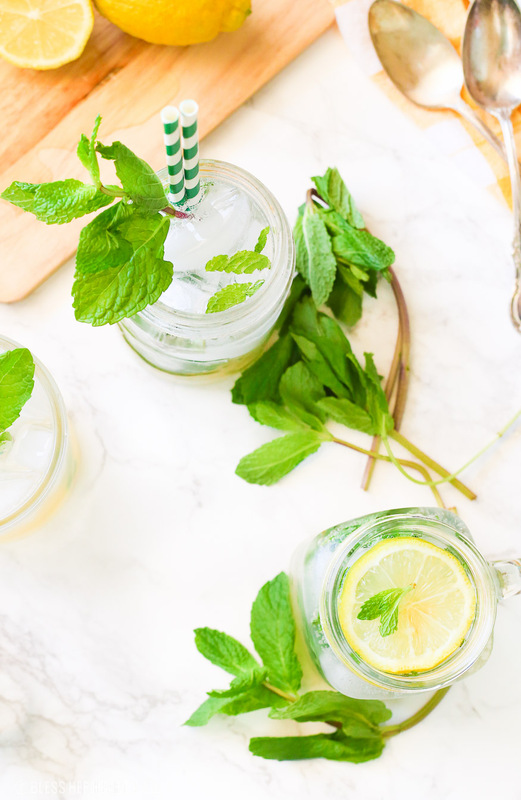 TWO: If you don’t like little bits of green floating in your cup, then as the simple syrup is cooling, muddle all the mint leaves for all 4 servings in with the simple syrup during the cooling process. 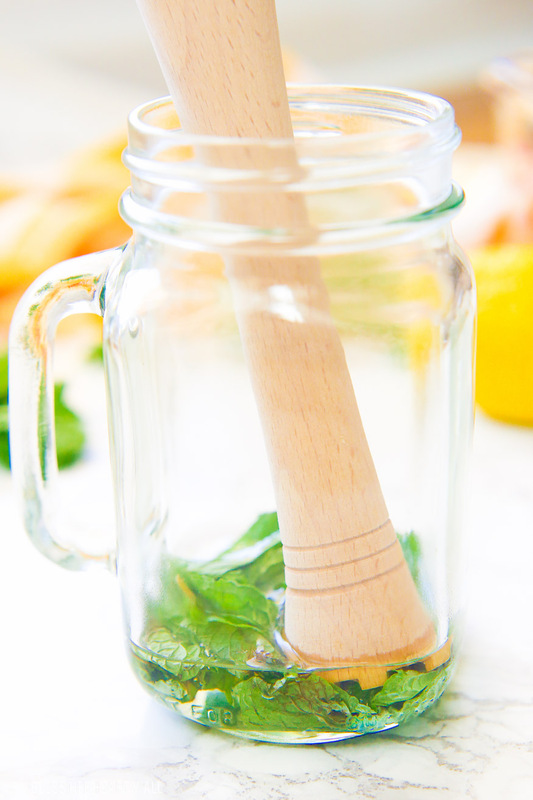 Once the simple syrup has cooled, then separate the muddled mint leaves from the syrup by running the mixture through a spaghetti strainer. After it’s been strained then you can add all your ingredients to your glasses without any little bits of mint floating around. THREE: If you are needing a mocktail of this lemonade mint julep then simply take out the bourbon. 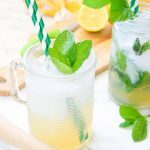 This lemonade mint julep recipe blends summer's most refreshing fresh squeezed lemonade and stirs it up into spring's hottest mint julep cocktail! 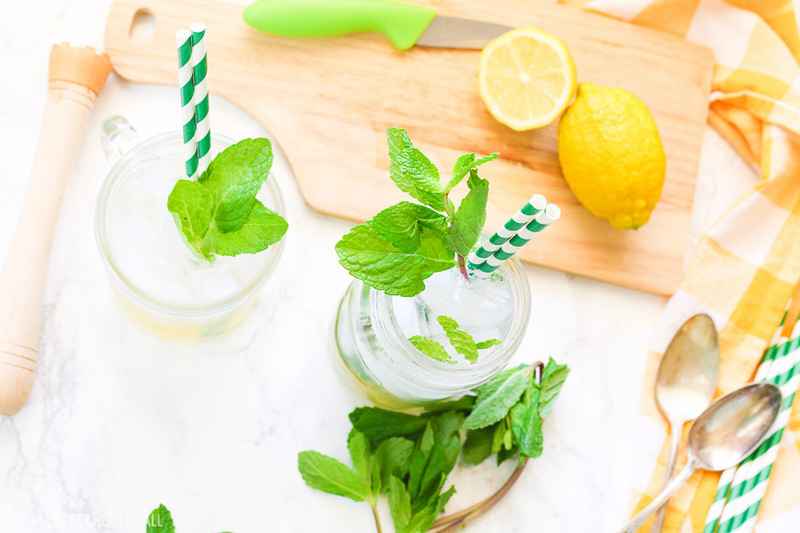 Lemon, bourbon, mint, and sweet that's perfect for an outdoor party, watching the Kentucky Derby, or just a relaxing time outside on your back porch! In a medium saucepan, heat the water and sugar over medium heat until the water starts to simmer. Allow to simmer for 1-2 minutes while the sugar dissolves. Remove from heat and set aside. Place the mint leaves and one shot of bourbon in the bottom of each glass. Muddle the mint leaves. Once the simple syrup has cooled enough pour the syrup in equal amounts into each glass and muddle the mint again. Top each glass with ice. 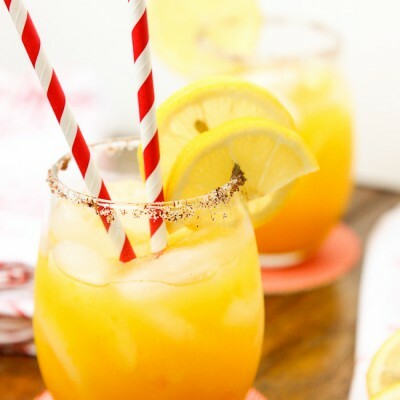 Pour 1/4 cup fresh lemon juice into each cup. 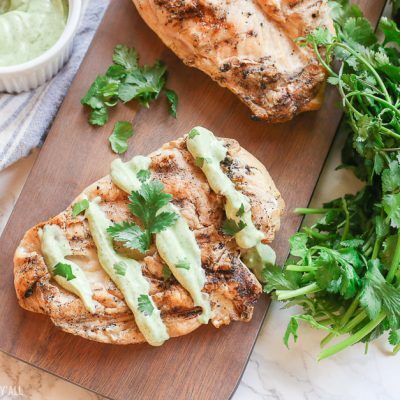 Top with sparkling water, add a straw, lemon slice and more mint leaves, stir, and enjoy! 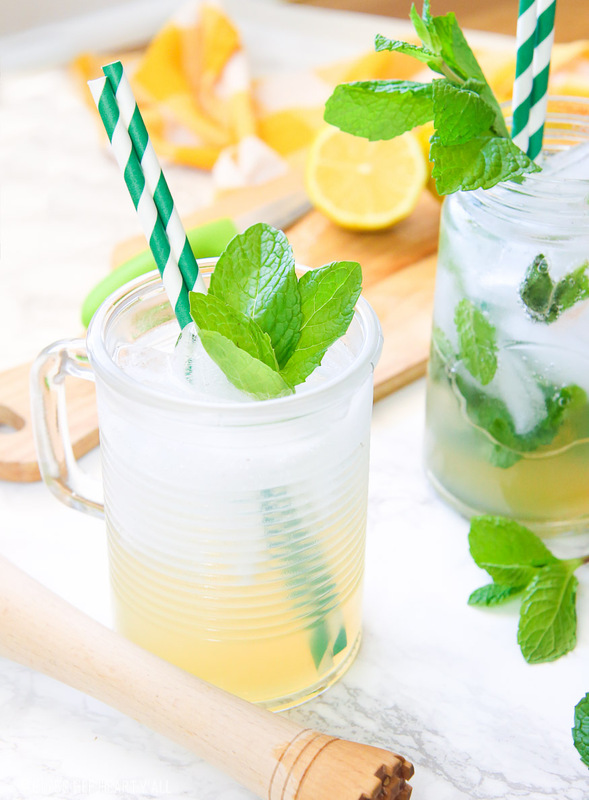 This lemonade mint julep recipe is intended for a 21+ audience. 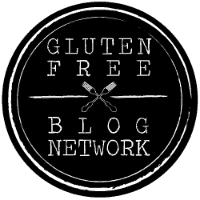 See other recipe notes in the "tips" section. Thanks for stopping in friends and please remember to drink responsibly and readers under 21 should make the mocktail option! Thanks!